SARAH: Aren't you going to open the door? DOCTOR: Not just yet. There's a slight problem. DOCTOR: Not exactly a malfunction. SARAH: Honestly Doctor, you ought to trade this thing in for a new one. DOCTOR: I wish you wouldn't say such things, Sarah. You'll hurt the old girl's feelings. SARAH: It is Earth, I suppose? DOCTOR [still checking controls]: Oh yes, it is Earth all right. SARAH: Are you sure? Look at the temperature reading. DOCTOR: Well it gets hot in Greece at this time of the year. SARAH: … not fly back to London? DOCTOR: At the time of the Trojan war? SARAH: That's all we need! Soldiers running all over the place with swords and spears and bows and arrows and wooden horses and things! DOCTOR: Don't worry, you'll be all right. A woman's worth five oxen in any market nowadays. SARAH: Oh very funny. How about trying to get us back to UNIT HQ? DOCTOR: I think that's going to be rather more difficult than it sounds. SARAH: I knew it: the Tardis has conked out. DOCTOR [still adjusting controls]: Well, the problem is, we're in a forbidden zone. I don't think they can have been on the watch when we landed, but as soon as we try to take off we'll simply be reflected back by the force-field, to land, with all the alarm systems going full blast, in a very unpleasant situation. DOCTOR: Stay here, and hope the camouflage still works. DOCTOR: Oh yes it has: we're invisible. SARAH: How do you know it's worked? DOCTOR: Look at the screen, Sarah. Don't you notice anything different? DOCTOR: What about the Tardis's shadow? DOCTOR: That's how I know we're invisible. SARAH : So what do we do now? We can't just stay here for ever. DOCTOR: No more than a couple of hours. This sort of juggling with light waves represents quite a strain on our energy banks. And don't forget the Tardis hasn't been properly serviced for two or three centuries. I must remember to do something about that. SARAH: Yes but what about getting us out of here before we're caught. And you still haven't told me who we're hiding from. DOCTOR: Never mind that now, Sarah. I've got to do some thinking, that's all. Ah! SARAH: You've got an idea? DOCTOR: No. But while you've been chattering, I've been finding out our exact position, and theirs. DOCTOR [playing with his yo-yo]: Probably not. SARAH: I thought you said you were going to think. DOCTOR [playing with his yo-yo]: I used to have a flute. I wonder what happened to it. SARAH: On no, you stick with your yo-yo. At least it's quiet. Anyway, you still haven’t told me who these people are. DOCTOR: Just leave all that to me, Sarah. The less you know about it the better. Why don't you go and find a nice ancient Greek dress from the wardrobe. It might come in useful. The Doctor smiles and continues playing with his yo-yo. Outside the Tardis. A sad procession comes up the hill: Kalchas, priest of Artemis and his assistants, Iphigeneia, drugged and supported by her maidens, Agamemnon, Odysseus, and other commanders of the Achaians. All find the heat oppressive. Iphigeneia is almost unconscious, and smiling. She stumbles from, time to time and would fall but for her weeping maidens. Agamemnon is tense, trying not to break down. Odysseus is grim. The procession halts at the stone altar. The priests sprinkle it with sacred unguents, while the maidens remove the garlands of flowers from Iphigeneia’s neck. The priests intone a sacred hymn as Iphigeneia is laid on the altar. Inside the Tardis. The Doctor lounging on a bunk. Enter Sarah wearing a Grecian dress. DOCTOR: Very nice, Sarah. Turn round. Sarah whirls to show the back and stops facing the viewing screen. DOCTOR: Where? [He leaps up] Oh, it’s all right, Sarah, they’re only humans. They can’t do us any harm. They can’t even see us. SARAH: What are they doing? DOCTOR: It seems to be some kind of religious ceremony. I shouldn’t look too close. These things usually involve blood. Through the viewing screen and so outside the Tardis. The maidens have moved aside to show Iphigeneia lying on the rock. The priests sprinkle her with unguents. An attendant presents a knife to the chief priest, Kalchas, who tests it with his thumb, then steps up to the altar and raises it to present it to the gods and ask their blessing on it. SARAH: We’ve got to stop them, Doctor! SARAH: We’ve got to do something! Outside the Tardis. The chief priest presents the knife to Agamemnon. The threnody of the priests ceases. In absolute silence Agamemnon takes the knife, looks at it, then at Iphigeneia, then presents the knife to the heavens. AGAMEMNON: Artemis, the sacrifice you desire is yours. Agamemnon turns the knife and holds it poised above Iphigeneia, ready to strike. AGAMEMNON [temporizing]: Great goddess, thou whose anger has kept our fleet becalmed these long, weary weeks, have mercy. Agamemnon prepares to strike, then pauses again. AGAMEMNON: Grant us a wind! Agamemnon glances despairingly around him. There is no sign of any change in the weather. The commanders are murmuring ominously among themselves. Agamemnon squares his shoulders and prepares to strike. Again his nerve fails. He lowers the knife. The commanders begin to murmur again. Kalchas the priest grins craftily. Odysseus steps to Agamemnon’s side. ODYSSEUS: You’ve got to do it. AGAMEMNON: I thought I felt a breeze. ODYSSEUS: Stop deceiving yourself. There’s no way out. AGAMEMNON: Are you sure? The gods can’t expect … [he gestures towards Iphigeneia] … my daughter! ODYSSEUS: What the gods expect no man knows, but Kalchas has convinced the army they expect the sacrifice of Iphigeneia. AGAMEMNON: I should never have agreed! ODYSSEUS: No, but having once agreed you can’t go back on your word – not if you want to remain commander in chief. ODYSSEUS [angrily]: High King of Mykenai, you have mobilised the whole of Greece to fight a quarrel that concerned only your brother, Menelaos. By the Olympian gods, you’ve staked the honour of our nation on the recovery of Helen from Troy. We’ve left our harvests, our lands, our homes, our wives. How many of us do you think will see them again? And you – you meet one set-back, and look at you! Do you suppose this is kingship? You must stick to your decision. Even if it is wrong, you must stick to it. Strike now! ODYSSEUS: If you don’t, you’ve lost the army. They’ll flock to Palamedes. You’ll be lucky to keep Mykenai – and don’t expect any help from me. I’ll be off back to Ithaca at the earliest opportunity. – You must strike now. Iphigeneia has agreed to die. She won't suffer. Look! Odysseus moves his hand in front of Iphigeneia’s eyes. She does not respond. ODYSSEUS: She's one of the lucky ones. No lingering, painful death for her. None of the grief of seeing her loved ones butchered before her eyes. All she'll know of this senseless war is a, young girl's dream. Strike now, before the drug wears off. ODYSSEUS: Look at that crafty smirk on Kalchas' greasy chops. How much do you suppose he was paid for his prophecy? What do you think he's been promised if Palamedes becomes King of Men? Kalchas steps forward and raises his hands for silence. The angry muttering of the commanders dies away. Odysseus leaves Agammemnon's side, moves rapidly to Kalchas, takes him by the arm and firmly moves him aside. Odysseus holds up his arms and stills the murmur of surprise. ODYSSEUS: Achaians! Lords and princes of the Argive hosts! Warriors who have crossed the wine-dark sea to retrieve the honour of our nation and avenge the insult offered by the Trojans! Look now upon the noble brow of Agamemnon, King of Men. The gods who reign on Olympus demand but little from mean souls. Only from the great do they claim great sacrifices! We have offended against the laws of Artemis, and she claims from our commander-in-chief the sacrifice of a life dearer to him than his own – his daughter Iphigeneia. The anguish in his heart and the salt tears that flow from his eyes are a measure of his sacrifice. Yet he will make it. And when it is made, no god can turn aside from his prayer. We are assured a fair wind to Troy and the favour of the gods to lead us on to victory. [He gestures towards the altar]: Receive, Artemis, thy sacrifice! Agamemnon, grimly determined, takes hold of Iphigeneia's hair, tips her head back and is about to cut her throat, when the Tardis shimmers into view. The Greeks gasp. The door opens and Sarah comes out. Kalchas falls face down or the ground and grovels. The commanders and priests drop to their knees, and, all except Odysseus, cover their faces. He watches as Sarah goes up to Agamemnon. Agamemnon drops his knife and falls to his knees behind the altar. Sarah bends over Iphigeneia and tries to rouse her. Finding the girl is unconscious Sarah tries to lift her, but cannot manage. She moves to a different position to try again and finds herself looking straight into the eyes of Odysseus. The Doctor comes out. He lifts Iphigeneia and carries her into the Tardis. Sarah follows. The doors close and the Tardis shimmers into invisibility. Odysseus scratches his beard thoughtfully. The other Greeks begin to stir and to mutter uneasily. Odysseus rises. Inside the Tardis. The Doctor and Sarah lay Iphigeneia on the bunk and watch the scene outside on the viewing screen as Odysseus continues his speech. ODYSSEUS: ...his knife was at her tender throat. You all saw what happened next. You all saw how the divine Artemis descended from the skies and with a sweet, mysterious smile bade him lay aside the knife. Then she raised the girl from the altar, placed her in her chariot, and sped with her to high Olympos faster than any eye could follow. Achaians! Victory is promised by this token. Agamemnon has the favour of the gods. Let Ilion’s walls and lofty towers tremble, for Agamemnon leads us on to victory! Odysseus seizes Agamemnon's hand and raises it in a victory salute. The Greeks cheer. Odysseus leads Agamemnon, who is dazed but exultant, through their midst. They crowd around to clap him on the back and congratulate him, then follow him down the hill. The priests follow in puzzlement, avoiding Kalchas, who walks alone. SARAH: He's got them eating out of his hand. Sarah switches off the screen and goes to look at the unconscious Iphigeneia lying on the bunk. SARAH: How could they do anything so evil? SARAH: Human sacrifice not evil? DOCTOR: Well they think it's the will of the gods. DOCTOR: Don't mock, Sarah, there are things here you may not understand. [He examines Iphigeneia]: Iphigeneia! Hmmm. She’ll sleep for quite a while yet. In the meantime I think we ought to get out of here. DOCTOR: Ah, but our friend out there has given me an idea. There's one place they won’t think of looking for us. DOCTOR: No more questions Sarah. Let's just say: if you want to hide from the gods, where better than Olympos? The hillside where the Tardis landed. The Tardis shimmers into visibility, then takes off. Scarcely has it disappeared than a ferocious-looking sea-monster appears on the hillside. A door in its chest opens and Poseidon and Leukothea come out. POSEIDON: Back to the Olympos. I want a full-scale investigation. They re-enter the sea-monster, which dematerialises with a noise not unlike that of a Tardis. Inside the Tardis. Landing takes place. DOCTOR: Well here we are, Sarah. What about a little stroll? SARAH: I thought you said it was forbidden. What about the gods? DOCTOR: Well, it is a crime that carries the death penalty – for a Time Lord. DOCTOR: You know me Sarah. You, know I can never control my curiosity. Besides, we can't sit here for ever. SARAH: But what if we get caught? DOCTOR: Then you just play the dumb Human who doesn't know where she is or what she's done wrong. SARAH: But I don't know. DOCTOR: Shouldn't be difficult then. He goes out. She follows. The Olympos: the docking bay, a magnificent hall with marble floor and walls and a lofty ceiling. Around the edges of the hall are a number of space-time craft disguised in various ways: a gigantic chariot drawn by golden horses, a thunder cloud, the sea-monster, a rock covered in seaweed, and the head of the Gorgon Medusa, with large teeth, protruding tongue and snakes for hair. The Doctor and Sarah: come out of the Tardis. Sarah is filled with wonder at the magnificence of the hall and the strange beauty of the craft. SARAH: Where are we, Doctor? DOCTOR: The docking bay of the Olympos. SARAH: What marvellous statues. – Look at that, it's just an old piece of rock. DOCTOR: Things are not always what they seem, Sarah. Ah, that's what I was looking for. He indicates the Gorgon's head. DOCTOR: Well, yes, she does have that effect on some people. But I'm very glad to see the old Aegis – she’s our one hope of getting out of here alive. DOCTOR: That's right. Come on! He rushes off. She follows. SARAH: Aren't you going to make the Tardis invisible? DOCTOR: We’d never find her again. I wish I could give her a less conspicuous shape, but it can't be helped. Ah, this way, I think. The Olympos: a corridor. The Doctor and Sarah dodge back and flatten themselves against the wall as a couple of gods pass by. They escape detection and move on cautiously. The Olympos: a marble corridor. The Doctor stops outside a pair of bronze doors. Sarah almost collides with him. DOCTOR: Look, Sarah. The gallery of the conference room. I wonder if the gods are in session. Come on. He opens the door cautiously and slips inside. The gallery of the conference room. 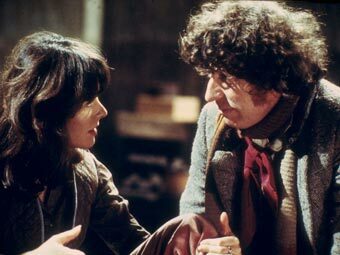 The Doctor and Sarah enter cautiously and peep down into the conference room, where the gods are meeting. The Olympos: the council of the gods. ZEUS is in the chair. POSEIDON is concluding his speech. POSEIDON: … and for those reasons I propose that we recommend to Council the establishment of a permanent research station on Earth. ZEUS: Thank you, Poseidon. Athene? ATHENE: Mr Chairman, it would impossible for me to disagree with anything more heartily then I disagree with Poseidon’s recommendation. Hitherto the most basic principle covering, our dealings with the rest of the Universe has been non-intervention in the affairs of less-developed peoples, except in those rare instances when we have been able to avert a catastrophe caused by other outside interference. Even then we have intervened only after the most careful consideration and limited our presence to the minimum. Poseidon’s recommendations, if accepted by Council, would lower us to the level of those imperialistic aliens who regard the existence, of other life forms as an opportunity for conquest and piracy! Some of the gods nod assent or murmur approval. Poseidon's supporter growl in disagreement. POSEIDON: Mr Chairman, we are talking about science! POSEIDON: That is precisely why we ought to take control of them. ATHENE: I should like you to consider what might have happened to us if we had been used as experimental guinea-pigs in the early stages of our development. Poseidon's supporters mutter jeeringly. Zeus bangs his staff on the ground for order. ATHENE: It is far from impossible. The Osirians, to name only one race, had the power. Athene’s supporters nod and mutter approval. Poseidon and his supporters feel that that this is not only unscientific fantasy but an insult to their race. POSEIDON: This is not just unscientific fantasy, it is an insult to our race! Hubbub. Zeus bangs his staff to restore order. ZEUS: I think it would be as well for us to remember that what we say here will have a considerable bearing on the ultimate decision of Council. This is not the time to allow ourselves to be carried away by passion. Council has established this temporary research station on Earth, and expects from us a balanced and rational recommendation on whether experimentation should be discontinued or established on a permanent basis. ATHENE: I agree that this is a tremendously important decision. We must recommend non-intervention. As I was saying, if the Osirians, or any other of the powerful ones of old, had interfered with our development, it is certain that we should not now be what we are. We should not be Time Lords. The Olympos: gallery of the conference room. POSEIDON [angrily]: There is someone in the gallery! ATHENE: Out of the question! POSEIDON: You know very well who it is. Well this time he's gone too far. This is a matter for Proctorial action. Excuse me, Mr Chairman. The Olympos: gallery of the conference room. From below comes the noise of the Time Lords leaving the meeting. DOCTOR: I think it's time we left too. SARAH: But … they’re Time Lords. DOCTOR: Yes, and, like Humans, Time Lords can be quite dangerous when they're roused. He peeps out of the door. DOCTOR: All clear. Come on. He ushers her out ahead of him. The Olympos: corridor outside the door to the gallery of the conference room. Sarah comes out. As she appears, the door opposite opens and a young, man comes out with almost equal caution. He and Sarah both start with shock and freeze looking at each other. The Olympus: gallery of the conference room. The Doctor jerks back from the door and flattens himself against the wall behind it. DOCTOR: Oh dear. The one person I can't possibly show myself to. The door opens. Sarah retreats through it. The Doctor stops her. DOCTOR: No Sarah! Go out. He won’t hurt you. I promise. But he must not know about me. He pushes her through the door. She goes reluctantly. The Olympos: the corridor outside the gallery of the conference room. Sarah stumbles out of the door into the arms of the Young Time Lord. YOUNG TIME LORD: Who are you? I’ve never seen you before. SARAH: Well, I'm a sort of a traveller. YTL: You're not one of us. At this moment the voices of Athene and Poseidon are heard down the corridor. ATHENE [shouting as loudly as possible]: I tell you it is quite impossible that there should be anybody in the gallery. POSEIDON: I know who you’re trying to warn. He bundles Sarah through the door from which he came and disappears after her just as Poseidon and Athene come round the corner. POSEIDON: There! Just as I thought! Your son! ATHENE: I didn't see anyone. POSEIDON: I don’t suppose you did. Well he won't get away with spying on the Research Committee. You can tell him from me he'll be up before the Proctors. ATHENE: Oh dear. He never could control his curiosity. Athene approaches the gallery door, opens it, looks in and gives a gasp of surprise. The Doctor comes out with his hands casually raised in a gesture of surrendering without fuss. Copyright in The Olympian Experiment belongs to Robin Gordon. Pleas see Copyright and Concessions for permitted uses.